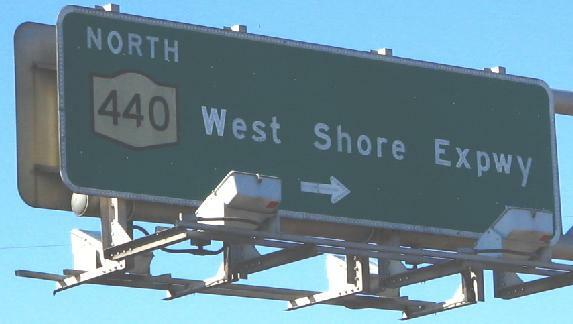 This page does not include the southern stub of the West Shore Expressway, which would have connected to the proposed Shore Front Drive (or South Shore Parkway) around the south shore of Staten Island. The photo above, courtesy Scott Colbert, is or was leaving the Park and Ride at that stub - I assume it still is, even though I didn't get a photo of it myself. See the big link at the bottom of this page for photos from that area. 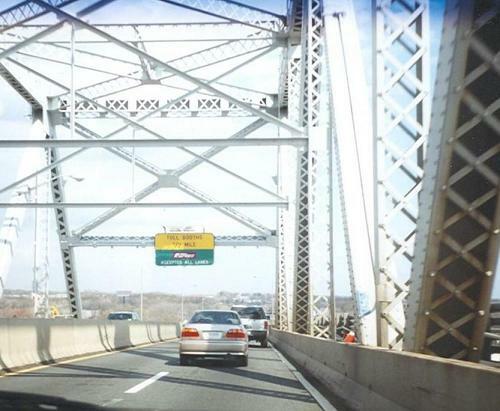 NB on the Outerbridge Crossing (named for Eugenius Outerbridge, not for being the outermost of the bridge crossings, which it also is), second photo courtesy Lou Corsaro. As complete as possible a set of NB button copy, first two photos courtesy Scott Colbert. 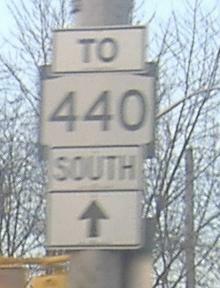 Of interest is the tacked-on NY 440 on the last BGS (which is flanked by the signs in the photos immediately before and after) - for a clearer version, click on it to see Scott Colbert's photo. 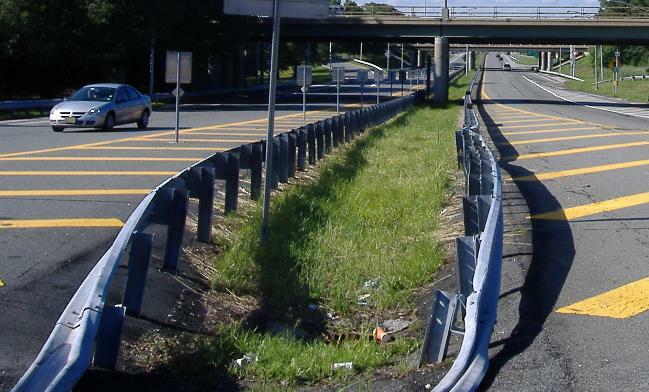 NY 440 was supposed to follow Richmond Parkway to Willowbrook Parkway, up the heart of Staten Island, tying directly into what is now the Willowbrook Expressway (see below). Instead, Richmond Parkway gives way into Richmond Avenue at Arthur Kill Road, with untouched natural land proving an insurmountable obstacle for the other two roads to get built. For photos of that, follow the link at bottom. 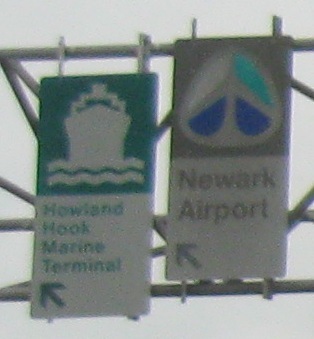 Anyway, for a few years, NY 440 did follow Richmond Parkway-Avenue to the Willowbrook, but was finally routed onto the West Shore Expressway when it was completed, to have an all-freeway route through the island, and that's when this shield was added. 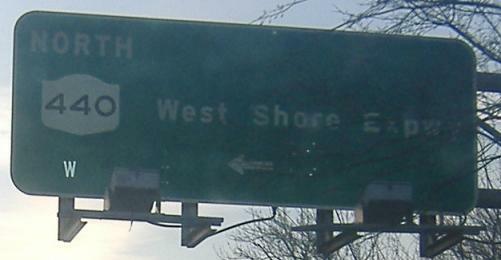 Presumably the sign predates the completion of the West Shore (i.e. when just a portion was open). 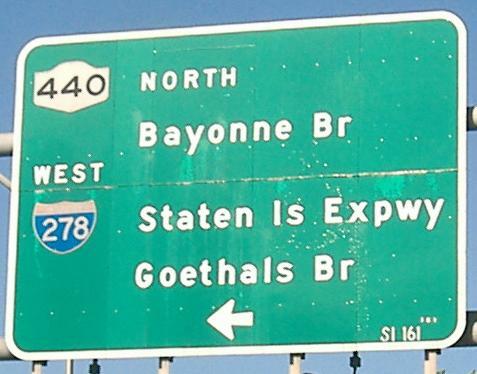 The button copy to be found on NY 440 SB. Any room to maybe use a few extra bolts? This is Veterans Road W. (frontage road) from Arthur Kill Rd. at Exit 4. The frontage roads on either side exist in pieces, thanks to undeveloped land (this is a theme, take note). Taken into the sun, Arthur Kill Rd. NB/EB in the same area. SB/WB, same spot. 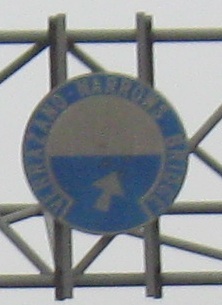 The Verrazano Narrows Bridge shield is on the same pole as that first sign. 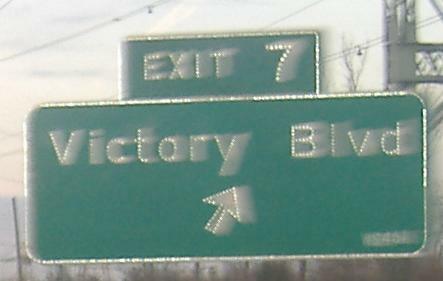 Victory Blvd. EB and WB at NY 440 Exit 7. Click on the second photo for an unobstructed view courtesy Scott Colbert. 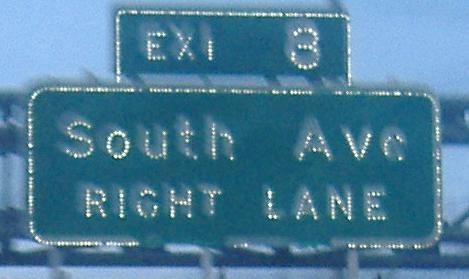 South Ave. EB at NY 440 Exit 8. WB, same spot. 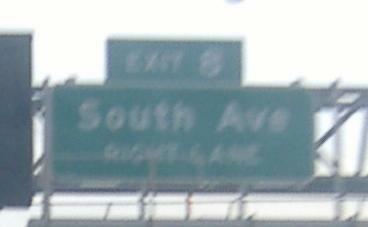 Like the signs at Exit 7, these must date to 1976 when the freeway was completed. 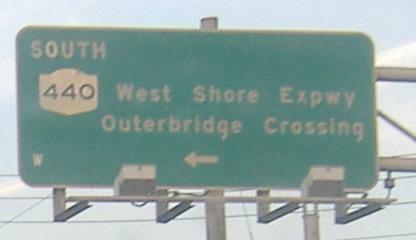 The Exit 4 signs on Arthur Kill Rd. don't have button copy - they either date to 1972 when the freeway was opened up to that exit, or replaced the original signs at some point after that. Victory Boulevard EB at the beginning of the ex-Willowbrook Expressway (now MLK Jr.). Looking southward at the MLK Jr. Expressway stub at Victory Blvd. Staten Island was planned to have a much more extensive network of freeways than it does. The original plan had the Willowbrook heading south to complement Richmond Avenue, meeting the Richmond Parkway. 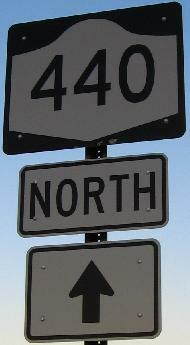 This all would have been NY 440, and indeed Richmond was signed NY 440 for many years. 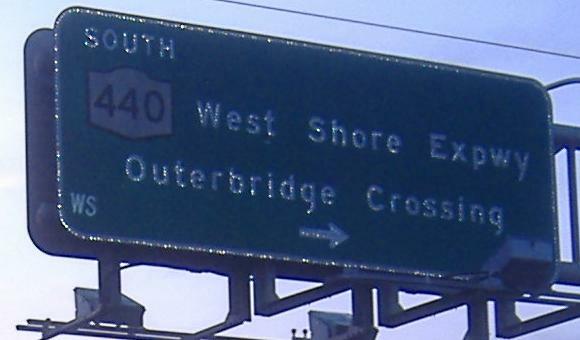 The West Shore Expressway, which now carries NY 440 from the Outerbridge Crossing to I-278, would have been a reference route or perhaps even an Interstate (if not a different state route), and there may even have been a South Shore Parkway or Expressway as well. Instead, there are stubs here and at the ends of Richmond Pkwy. 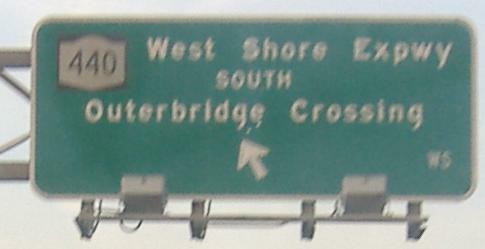 and the West Shore, and an entire ghost interchange on I-278. 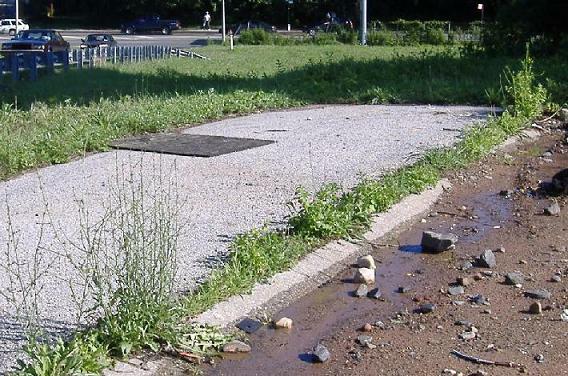 Original curb and shoulder on the stub that have never seen traffic. Now looking northward at the beginning of the Expressway, with I-278 immediately in the background.